However, these changes also provide considerable opportunities for the shrewd Commercial property investor. But more on that later. It is a huge mistake, when governments rush to provide financial support to declining manufacturing industries. Clearly, those industries will never sustain a profitable position — given Australia’s relatively small population, and the?consequential short production runs. The sad reality is that some companies need to be allowed to fail (or be absorbed) … so the more competitive and profitable companies can become more productive. There has been much publicity given to recent layoffs from companies downsizing. But interestingly, unemployment levels have remained steady — and in some months, even fallen. Sure, the mining sector is chasing more employees — to the point of having to “import” them. But not all those laid off are heading west or north. And besides, the mining boom will not continue for ever. As such, there must be something else going on within the Australian economy … which is helping to sustain growth — both now, and into the future. And the earlier graph provides you with the answer. 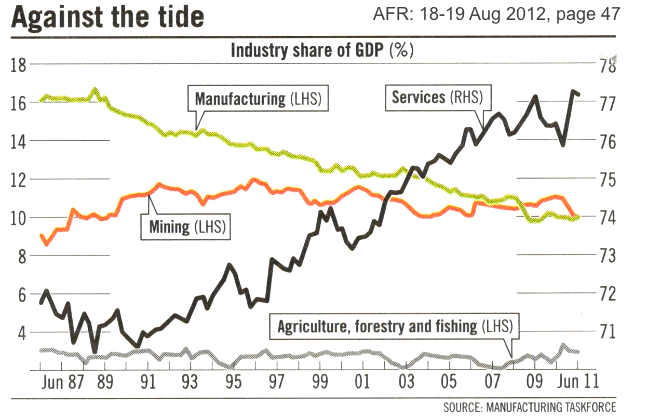 The sector-by-sector comparison shows that Services alone currently contribute around 77% of Australia’s GDP. 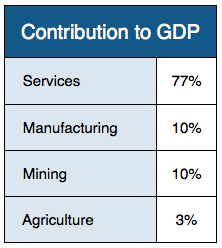 And Manufacturing, Mining and Agriculture combined … are contributing only about 23% of GDP. Therefore, Australia needs to focus upon its obvious strength — providing highly-educated specialist skills, to local and overseas markets. For example: Our mining firms have not flourished simply because Australia has resources, which the rest of the world needs. Much of the profit stems from the cutting-edge engineering solutions adopted by our companies — which have provided them with clear cost advantages. Furthermore, many of the world’s breakthrough technologies and techniques have been developed by Australian scientists, doctors, engineers, architects and the like. This is where governments need to be investing heavily — rather than propping up failing industries, with little or no competitive advantage. Compared to many Western countries, Australia already punches well above its weight for productivity in the Knowledge and Service sectors. And for Commercial property investors … this surging Service sector will always be needing Offices, Design Studios and related accommodation into the foreseeable future. Therefore, that augers well for the suburban Strata-Office market.